Rock Star Journalism: You began your musical career in 1980s Germany. Describe the industrial music scene when you were getting started. En Esch: The only "industrial" bands around at that time were Einsturzende Neubauten, Throbbing Gristle and Test Department. There wasn't really an "industrial scene" when I was starting out. RSJ: Do you still keep up with what's happening in the overseas musical community? EE: To a limited extent I do. I know from friends who are living overseas what music is popular there, and of course they always mention if my music is being played. Last I heard, Slick Idiot's "Xcess" was a recent club hit in Holland. RSJ: As someone who's been part of the industrial scene for a considerable period of time, what are your feelings on the scene's current direction? EE: Is there any current direction? I miss individualistic and unique work being done. Too many bands, especially in the US, sound like a poor man's Skinny Puppy. RSJ: Do you consider Slick Idiot a specifically "industrial" project? EE: I don't consider it to be specifically industrial or any other style. I try to avoid that. The perception seems to be that it is industrial, but I believe that is because that is how the fans identify what I have done in the past. RSJ: ScrewTinized seems more varied than your last album, DickNity. Tell me about your approach to creating this album. EE: It was created in a less constructed way with more spontaneity and with more humor. It was not a planned departure, rather a natural flow. RSJ: You've continued to work with Slick Idiot partner Guenter Schulz throughout your career. Why do you think this partnership has survived for so long, whereas others have fallen apart? EE: Guenter and I have a strong friendship and work well together. At times, we come from different places to get to the same point -- the music we create. I appreciate his untouchable talent and musicianship, so any "struggles" along the way are worth it because I know in the end we will have created music that I can be proud of. RSJ: You've done several covers in your career, including "Ain't Talkin' 'Bout Love" on ScrewTinized. What makes you want to cover a song, and what do you think are the elements of a good cover? EE: Sometimes a song catches me, and I recognize that it would be fun to interpret it in my own way. Typically the songs I've covered are of music my own fans wouldn't be caught listening to. RSJ: You put out an accompanying remix disc to DickNity, titled ReDickUlous. Do you have any plans to do the same for ScrewTinized? EE: We recently announced on Slickidiot.com that there will be another remix contest. At this time we are taking e-mails to see what songs will be included. 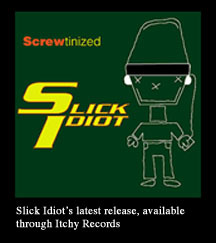 RSJ: DickNity received distribution through Cleopatra; why did you not work with this label for ScrewTinized's release? EE: Prior to the release of DickNity, it was decided by both parties that this would be the only Slick Idiot cd released on Cleopatra. RSJ: You have your own label, Itchy Records. Do you have any plans to sign other artists or will this only serve as an outlet for your own work? EE: At this time there are no bands signed to Itchy Records, but there are possibilities for the future. RSJ: You spoke at the Global Entertainment Summit about ways that independent artists can distribute their work. What advice do you have for underground artists trying to get work released? EE: Always work on your music, work on your live performance. Get on stage whenever and wherever you can. Self-release. Self promote. Prove your intention with continuous work, even if it's something small. 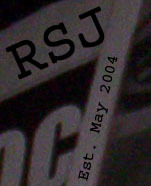 RSJ: You employed a very unique distribution method for the first release of ScrewTinized, having fans purchase the cds in bulk from you and then distribute them. How did you come up with the idea to have fans act as middlemen? Were you happy with the results of this technique? EE: We weren't getting any offers that were acceptable, so we needed to create our own financing. I came up with the idea out of necessity really. It worked out better than we even expected. It is hard to put into words how satisfying it was to see the response from our truest fans when they were given the chance to be part of the production and release of ScrewTinized. RSJ: Fan involvement has become an integral part of Slick Idiot, as you held a remix contest for DickNity and let fans vote on the name of your new album. Why is fan participation important to you? Do you have any upcoming plans to further involve fans? EE: The fans will always be involved with Slick Idiot. Because of all of the involvement they have already had with Slick, we have gotten to know our fans in ways a lot of other artists never do. And from that, I can honestly say, Slick Idiot fans are the most loyal and best fans around -- certainly they are the most included and involved in what we are doing. RSJ: You will be heading out with Pigface again for their next tour in the spring. Why did you choose to do this instead of touring Slick Idiot specifically? EE: Participating in Pigface is always a great experience for me. 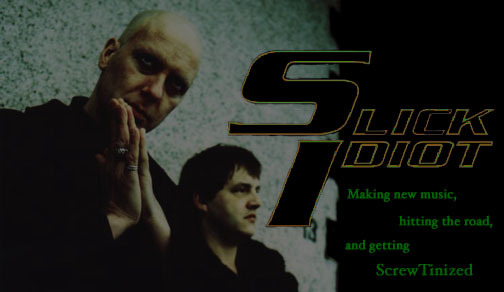 While I'm performing with Pigface, I will also be able to get the word out about ScrewTinized. We'll have new Slick t-shirts and of course cds for sale. As a result, this can create some excitement for our Slick Idiot tour in the fall. RSJ: What is the most interesting aspect of working with Pigface? EE: It is a high energy, collaborative effort that involves a lot of creativity with a mix of artists from all over the world in a short-lived time span -- there's nothing else like it. RSJ: When you contribute to Pigface albums, how much creative freedom are you given? EE: I have complete freedom when writing lyrics. The music is a collaborative effort and so offers less individual control. RSJ: Are there plans to incorporate any Slick Idiot or KMFDM songs into the Pigface show? EE: There was a Slick Idiot song included on the last Pigface tour, and we'll decide during rehearsals what to include on this tour. It is possible you will hear another Slick Idiot song and maybe even a KMFDM song as well. RSJ: After being in New York for eight years, why did you choose to move to LA? EE: I have always been interested to experience the famous LA weather. Of course, I also wanted to check out the scene and hang with friends who have been there for years, like Ogre and Abby Travis. When the Pigface tour is over, I'll be headed back to New York though. RSJ: What differences have you found in California's music scene? EE: The goth/alternative scene seems larger in LA than on the east coast. RSJ: You've lived in many different areas in the US, including Chicago, New Orleans, New York, and LA. Where did you find the most conducive music scene? 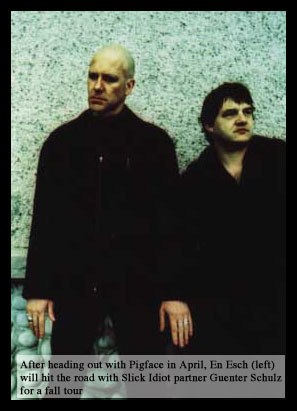 EE: Chicago during the Wax Trax era definitely had the most impact, especially just coming straight from Europe. The times of Thrill Kill Kult, Ministry...it was very impressive. RSJ: You were recently able to DJ at Das Bunker in LA. Is this something you've always been interested in doing? EE: I was invited to do it, and I had DJ'ed a couple times in New York. It's a fun time to get out and play interesting tracks that people don't expect. RSJ: What kinds of music do you like to spin? EE: I want to spin a grotesque mixture -- not just typical techno. When I spin, it's more like The Clash vs. ICP. RSJ: While you were with KMFDM, you released a solo album that differed greatly from that band's work. Do you have any interest in putting out another solo album? EE: I am sitting on tons of material, and when I find the time to go through it, I would put together another solo album. RSJ: What do you feel you still have to accomplish musically? EE: I'd say that would be to do a film score for an interesting movie.